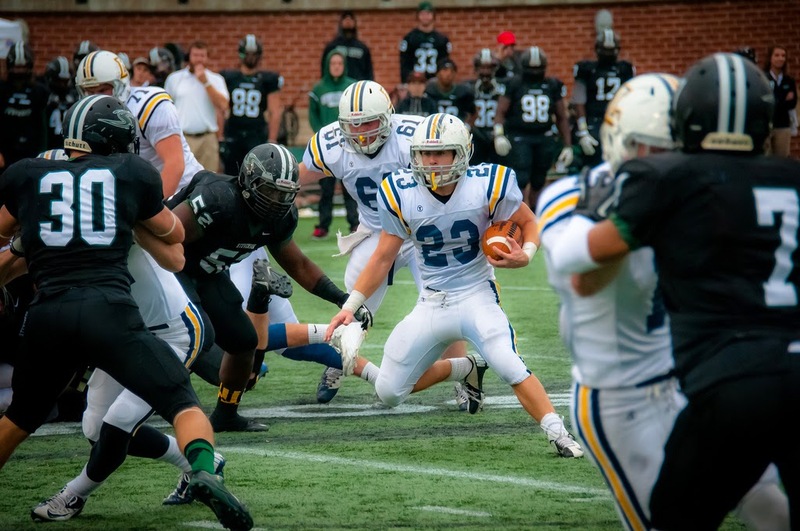 MAC Football News: Lycoming Football Video - Sr RB Craig Needhammer "It's Not Where You Start, It's Where You Finish"
Lycoming Football Video - Sr RB Craig Needhammer "It's Not Where You Start, It's Where You Finish"
2014: A First Team USA College Football Network Preseason All-American ... Enters season tied fourth in school history with 26 rushing touchdowns (three from school record), fourth with 2,471 career rushing yards (1,194 from school record) and seventh with 510 rushing attempts (263 from school record) ... Also third with 10 career 100-yard rushing games (five from school record) ... Fifth in school history with 3,424 career all-purpose yards (1,050 from school record) and holds school record with 114.1 all-purpose yards per game ... Fourth in school history with 29 touchdowns (26 rushing, three receiving) (six from school record) and seventh with 174 total points scored (48 from school record). 2013: Earned First Team All-Middle Atlantic Conference honors and Third Team D3football.com All-East Region accolades … Also named to the Capital One Academic All-District IV team … Named college’s Sol “Woody” Wolf Award as the most improved junior athlete … Started all 10 games … Ranked 37th nationally for all-purpose yards … Ranked 34th nationally for rushing yards per game, recording 118.4 yards … Ran for 1,184 yards on 245 attempts … Averaged 4.8 yards an attempt and scored 11 rushing touchdowns … Had 12 receptions for 131 yards and three touchdowns … Tied program record with 14 touchdowns scored … Recorded 224 yards on 10 kick returns … Had seven 100-yard rushing games, the second-most in school history, and rushed for more than 130 yards five times … Recorded three rushing touchdowns against Misericordia and FDU-Florham … Posted three receptions for 35 yards and a touchdown against Albright and Kings … Recorded more than 100 all-purpose yards in nine games … Named the team’s Offensive Player of the Year and given the David G. Busey Award for academic and athletic achievement … A member of the MAC Academic Honor Roll. 2012: Played in all 10 games … Ran for 664 yards on 155 attempts … Finished sixth in the league in rushing (66.4) and 18th in total offense … Had seven receptions for 55 yards … Recorded 109 yards on five kick returns … Had eight rushing touchdowns, tying for the team lead … Ran for 127 yards and a touchdown against Stevenson … Posted a 61-yard rush against Lebanon Valley, helping clinch a 21-13 win … Had eight tackles as a special teams player … A member of the MAC Academic Honor Roll. 2011: Played in all 10 games ... Led all MAC freshmen in rushing ... Ran for 623 yards in 110 attempts, finishing eighth in the league at 62.3 yards per game ... Scored seven rushing touchdowns ... Rushed for more than 50 yards seven times ... Ran for season-high 104 yards against FDU-Florham ... Notched 91 yards and two touchdowns on eight carries at Westminster … Had three receptions for 26 yards ... Recorded 20 kick returns for 408 yards … Broke two 40-plus-yard runs, going for 47 at Westminster and 41 against FDU-Florham. High School: A 2009 third team all-state member … A 2010 Mini Maxwell award winner … The all-time leader in touchdowns at North Penn (48). Personal: Son of James and Cathy Needhammer … Has one sister, Rebecca … A physics major … Favorite movie is “300” … Favorite athlete is Brian Dawkins.